Molly Stinchfield and I had such a great time with Whitney and Mark’s engagement session! Whitney’s father is big on sailing and taught Whitney as she was growing up. The Roton Point Association, of which her father is a member, was the perfect location for Whitney and Mark’s engagement shoot. We had the yacht club all to ourselves, and took full advantage of the hazy afternoon New England light, especially as it filtered onto the grand patio of the club house. 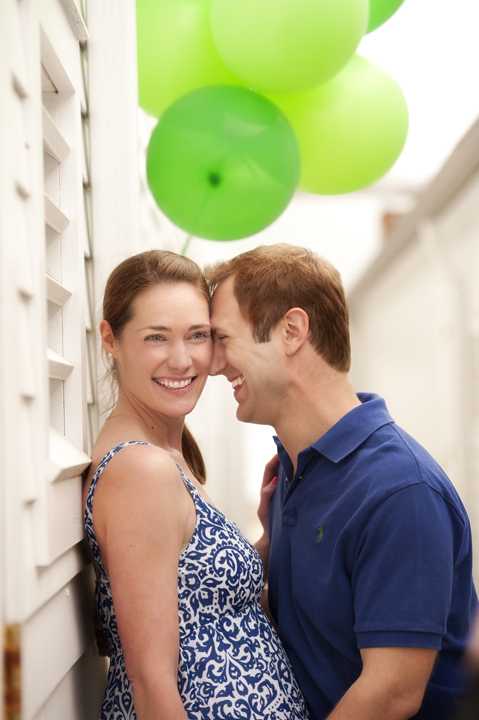 When Mark had proposed to Whitney, he had brought along green balloons. He had her pop them one by one, in anticipation of the big moment. As we got into the session, we could see that Mark was fun, silly, and full of surprises…and how much he absolutely adores Whitney. Whitney and Mark, it was a pleasure for Molly and I to photograph the two of you. We loved incorporating the balloons into your story, shooting at a place that is meaningful to you, and working with all of your fun energy! Best of luck with the wedding!!! Viv and Molly were amazing to work with. Not only are they extremely talented, but they are fun too! They made us feel comfortable the entire time we were there and because of that we were able to enjoy our day together. To give you an example, I’ve been going to Roton Point since I was a kid and never noticed this hallway that has a direct line of sight to the Lighthouse. With their keen eyes, they saw this immediately and we were able to take some great photos in that hallway. The price was more than reasonable. In fact, my fiance and I found ourselves wanting to give them more money than they charged because we felt they were so dedicated! You won’t be disappointed if you choose Viv and Molly for your photos. They gave us pictures that will last a lifetime and we couldn’t be more thankful!